Die Telekom macht Ernst mit besserem Service! 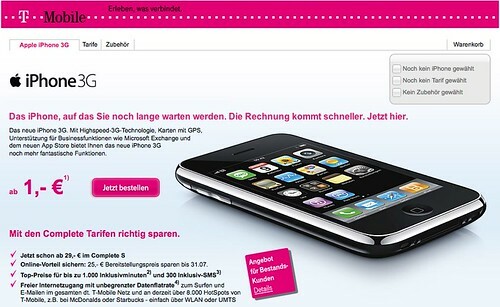 Hatte gerade einen sehr skurrilen Anruf von einem Mitarbeiter der Telekom / T-Mobile. Und zwar ginge es darum, dass man den Service für die Kunden verbessern möchte. Fein, da helfe ich gern, wo ich kann! Der Grund seines Anrufes: die Telekom möchte mir zukünftig Serviceinformationen auch per Email zukommen lassen und hätte dafür gern mein Einverständnis! Hmm Serviceinformationen? Vielleicht von Partnern? aka Werbung? Nein, nein - keine Werbung... Nur wichtige Serviceinformationen... und nur 2-3 mal im Jahr... naja, vielleicht auch 4 mal... höchstens... Okay, warum nicht. Dann wurde mein Einverständnis noch akustisch aufgezeichnet - der Ordnung halber. Und schon war der Herr von Telekom zufrieden. Kurze Frage noch von mir zum Abschied: Was für eine Email-Adresse haben Sie denn von mir? Antwort: Ähh, keine! Soll ich ihnen eine geben? Nein, danke. Mir ging es nur um das Einverständnis. Ach so, na dann... gut, dass wir gesprochen haben...!? Need Coffee ? Ask your Mobile Carrier ! Nowadays nearly everybody in Europe already got a mobile phone and the market is pretty much saturated. So if a carrier wants to grow its business, he has to come up with something new, e.g. some slick marketing strategy. Virgin Mobile tried viral marketing last year and achieved very impressive results with it: they were able to add more net customers than their five main competitors put together ! And it looks like Virgin will try to duplicate this success in 2004 ! Last month, this year's first clip was released, featuring Christina Aguilera caught in a seemingly compromising position (Quicktime Movie). Now, only 2 weeks later, a second campaign has just been launched. This time Virgin wants to communicate its "superior service quality" with a nice viral clip , which shows people, who are clearly used to a better service... Both campaigns are once again planned, seeded and tracked by the viral marketing wizards of DMC, London. What will be next ? About 120 Coke cans are being covertly converted into a combination global positioning satellite receiver and cell phone. (...) Consumers who find the winning cans activate the technology to call a pre-programmed hotline. They then must agree that Coke "search teams," using the GPS tracker, can surprise them anyplace, anytime up to three weeks to deliver the prizes, which include a 2005 Chevy Equinox SUV, a chance on $1 million through Harrah's Casino, Disney vacations and home entertainment systems. The technology tracks cans to within about 50 feet anywhere in America, and winners must carry the cans at all times until one of five prize teams around the country shows up to exchange the prize for the can. "It's all about the surprise," Schiller says. A voyeuristic bonus: At the sweepstakes' Web site (www.unexpectedsummer.com) consumers can watch the tracking of cans that have been called in.